Tammy Tyree, along with her uncle and brother, have been struggling to make ends meet. She works around the clock to earn money for her family and has several jobs that she is desperately trying to juggle. So, when she receives an email informing her that she inherited five million dollars from relatives she didn’t know she had, she’s more than a little delighted and more than willing to dig up all the fees she has to pay in order to get her inheritance. When the rest of the people in the small town of Spring, Washington hear about Tammy’s good fortune, they immediately jump on the bandwagon. They want, and expect, to get a piece of the action as well. However, the situation becomes dire when everyone starts to financially suffer and it appears like nothing is coming in to help them. What an interesting concept for a book and I’m surprised it hasn’t been done to death already. However, this is the first time I’ve seen this storyline used in a fiction book. Anyone who participates in cyberland has received some kind of e-mail with a scam in it – we’ve all been told we’ve won or inherited millions of dollars. I immediately delete them but Tammy Tyree believes every word of it. Sometimes a character is almost portrayed as “too stupid to live”. In this case, I felt Tammy was so naïve, I just wanted to hug her. My heart went out to this young girl who is just trying to keep her family afloat. She’s so desperate that she falls for a scam that most people would see through in a heartbeat. This is a storyline that fits in with the way the world is today. A topic that we’ve all come across at some point in this day and age of computers – scammers. It’s a poignant tale. It’s touching with quite a bit of humor thrown in. I wasn’t sure I’d even like this book, but I ended up truly loving it. I listened to this on audio in the car and it struck several emotions – sadness, happiness, anger, annoyance…I felt it all as I listened to Tammy’s plight. Patricia Wood has created a unique and quirky story. Michelle Babb did a spectacular job of making me truly care about Tammy. 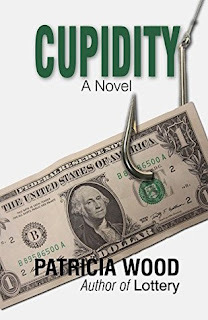 I really need to check into Patricia Wood’s backlist. She’s a new-to-me author. I loved every minute of this one. I was so disappointed when it ended. I already miss Tammy and her brother Jar. When I don't want a book to end, it rates high on my list. That is definitely a different premise and I'm intrigued. It does seem hard to believe she'd fall for that scam, and the townspeople too so I have to see how Wood handles it and makes it believable. With a glowing review like that, I have to get a copy!